Fences aren't easy to come by in Red Dead Redemption 2, but this guide will show you how to unlock every single one. Whenever you come across stolen or valuable items in Red Dead Redemption 2, you're going to need a special merchant to sell them to. In this Red Dead Redemption 2 fences guide, we'll be providing you with all the information you need to go about unlocking the merchants within the game. 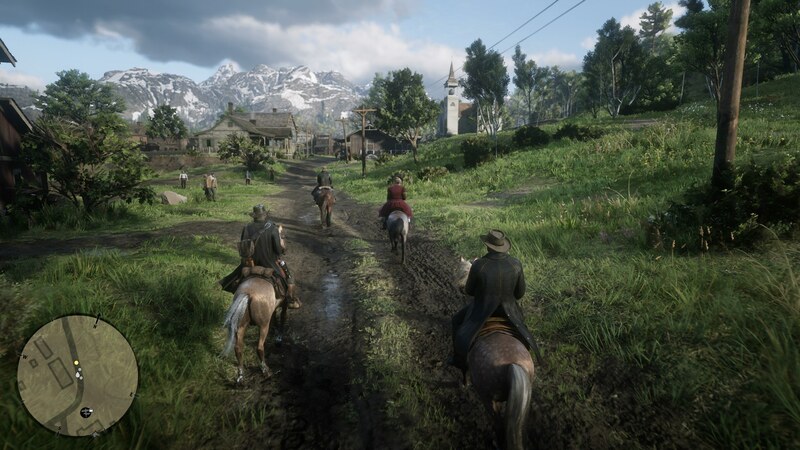 If you instead need help with any other areas of Rockstar’s latest game that isn't about selling stolen goods to fences located around the RDR2 map, you’ll want to head over to our main Red Dead Redemption 2 guides hub. It’s on this central page that you can find a full beginner’s guide for the huge game, as well as a comprehensive list of all our in depth guides on different areas of the game. It goes without saying that in the aftermath of a shootout in Red Dead Redemption 2, you should always loot the corpses left on the battlefield. You’ll begin to stack up some pocket watches, belt buckles, and other items that fall into the ‘Valuables’ category in your inventory, but you can’t sell these items at a General Store, or any other shop you might find in towns like Valentine. You need to find a fence in order to sell these illegally obtained items. In order to unlock a Fence in Red Dead Redemption 2, you want to keep an eye out for the story missions of Hosea Matthews. The opening mission for Hosea has Matthews and Arthur Morgan tracking down a huge bear, but it’s the second mission that has you unlocking a Fence, after you’ve completed the mission by successfully stealing a wagon. After Hosea’s second mission has been completed, the Fence will always be open for Arthur to use. 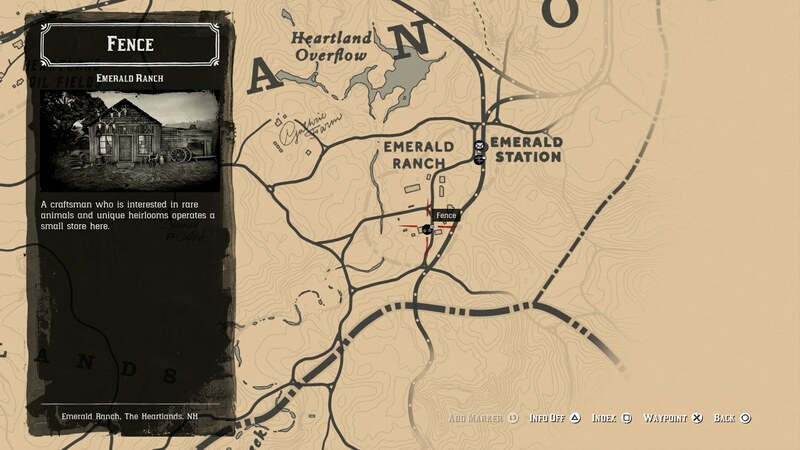 You can find the Fence on Emerald Ranch, open during the day. Simply approach the Fence, choose the ‘Sell’ option, and you can pass off any of the valuables you’ve accumulated through combat or thieving, for a tidy sum. But, there are other Fences scattered around the world of Red Dead Redemption 2. Just below, you can see the location of three additional Fences that we've tracked down, which can be found in the northern Rhodes area of the map. 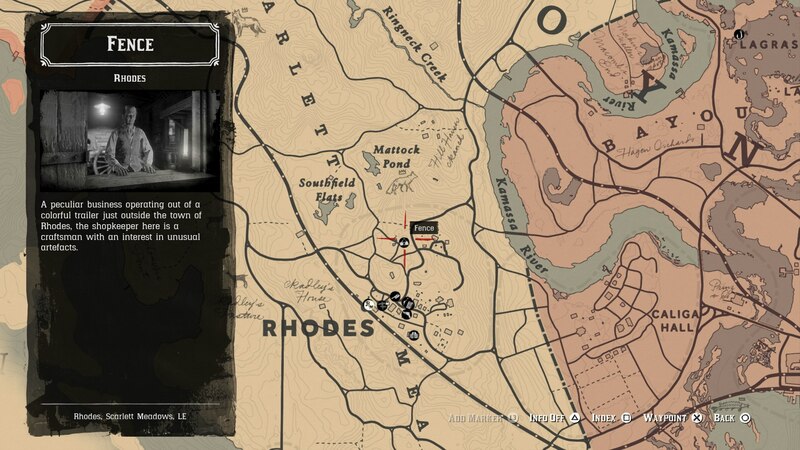 There's no mission to unlock this Fence, you'll simply unlock it as soon as you've completed Micah's story mission detailed above, and made it to Rhodes. Next, there's another Fence found tucked away in Saint Denis. 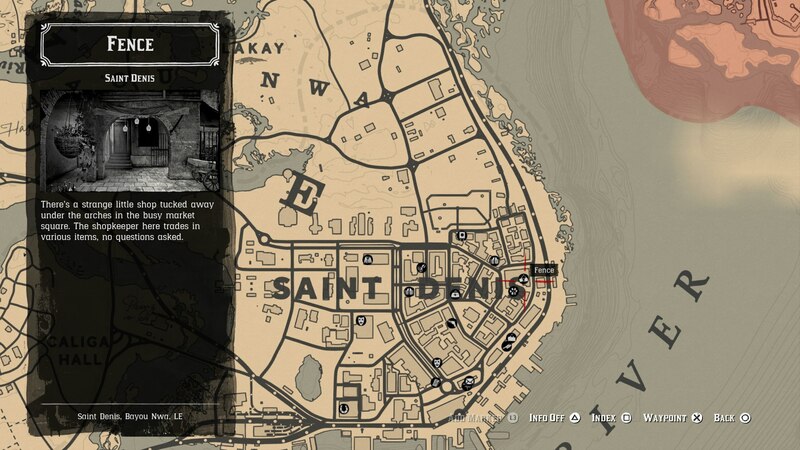 Like the previous Fence in Rhodes, there's no story mission required to unlock this Fence, and you can simply find them whenever you make your way to Saint Denis. 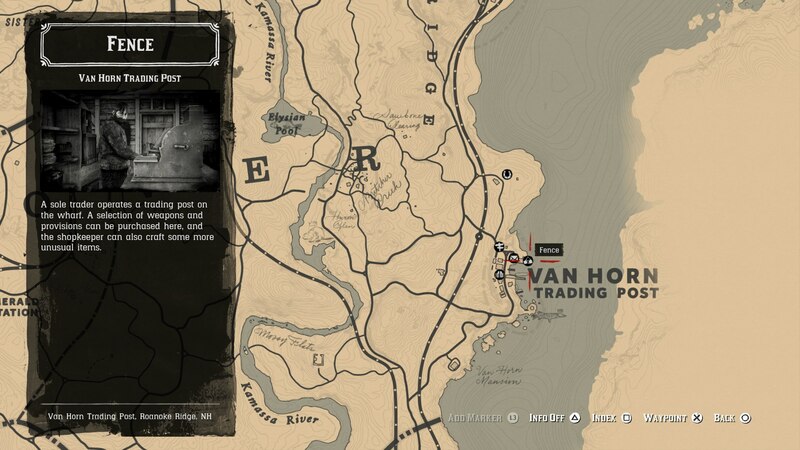 Finally, there's a Fence that can be found in the Van Horn Trading Post. Note that this Fence won't automatically show up on your map, and you'll have to actually visit the pier in the trading post in order for the shop to unlock, and show up on the map. One of the best ways to get your hands on other people's valuable items without paying for them is to loot dead bodies. While you might think that doing this isn't hurting anyone (the person is dead, after all), this is an illegal activity and will put the law onto you if you're spotted taking what doesn't belong to you. The best time to steal from a corpse is when no one is around, so just hold tight until the area is clear before plunging into a dead man's pockets. Any time you take an item that doesn't belong to you, it's technically stolen, be it an item from a drawer in a building or a horse you've taken from a rider you've just killed. Be careful when doing anything like this as it'll likely lead to a bounty being placed on your head. Now that we’re all wrapped up with this Red Dead Redemption 2 guide, and you know how to go about unlocking a Fence for your valuables, why not check out our additional guides on the game? You can head over to our Red Dead Redemption 2 weapons customization guide, or our page on how to pay off a bounty in Red Dead Redemption 2, in case the law are hot on your heels.